FRANKLIN, Mass. – After an eight day break between games, the Franklin baseball team was eager to get back out on the diamond. 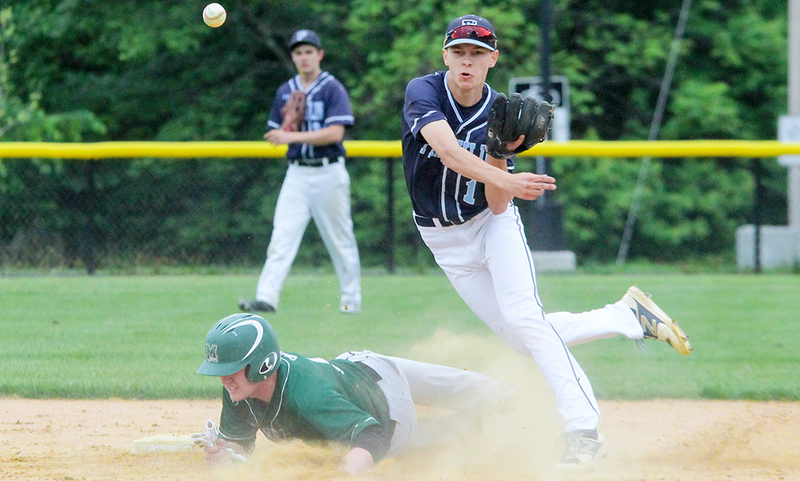 That eagerness showed in the form of early offense, as the top-seeded Panthers scored six runs in the first three innings en route to beating 17th-seeded Marshfield 6-1. In the bottom of the first, senior Ryan Hodgkins singled with one out and stole second, then advanced to third on a groundout. Josh Macchi singled into center and scored Hodgkins to give Franklin an early 1-0 lead. In the top of the second inning, Marshfield had a runner on first with two outs when Jarred Pellegrino hit what looked to be at least a single into the gap in left center, but a fantastic diving catch by Jake Lyons ended the half inning. Franklin took that momentum and used it at the playing, rattling off three straight singles to load the bases. Cam Lupien brought Tyler Gomes home on a fielder’s choice to put Franklin up 2-0. With runners at the corners, Lupien took off for second, and when Marshfield threw down to second, sophomore Alex Haba broke for the plate from third. Instead of trying to get Lupien out, Marshfield threw home but Haba beat the throw and Franklin went up 3-0. A Jake Noviello double then put runners on second and third, and after Lyons grounded to third, Marshfield tried to get Lupien out at the plate but the throw was late and Franklin went up 4-0 and Lyons reached safely. Hodgkins then grounded out to second, but Noviello scored from third on the play and Franklin extended its lead to 5-0. Marshfield starter Eddie Kielty got out of the jam by striking out the next hitter, but a 1-2-3 top of the third from Noviello let the Franklin bats get back to work. On the strength of three singles, Franklin loaded the bases with just one out, but Marshfield got a force out at the plate. With Noviello at the plate, Kielty’s pitch in the dirt bounced away from the Marshfield catcher and Haba scored from third to put Franklin up 6-0. “We work hard on just trying to manufacture runs, I don’t think we have a tons of guys who are going to hit home runs, so we have to find some different ways to score runs, and today was just another example of guys with heads up base running,” said Franklin head coach Zach Brown about Franklin’s work on the base paths. From then on out, the star of the game was Noviello, who pitched six innings, allowing just one unearned run and only four hits — all singles — while also striking out six and earning the win. Noviello also went 2-for-3 at the plate and scored a run in addition to his work on the mound. “Every time he has the ball in his hand, we feel really confident that he’s going to give us a great effort, and he did a great job for six innings,” added Brown about Noviello. Marshfield put a run on the board in the top of the sixth when John Viola reached on an error to start the inning and then advanced on a single from Sam Crawford before scoring on a single by Kielty. It would end up being the only inning Marshfield had more than one hit. With the win, Franklin baseball moves on to play eighth-seeded Durfee at home at 4:00 PM on Monday. It will be a rematch of last year’s first round matchup, when the Hilltoppers beat the Panthers in Fall River. Foxboro, 2 @ Franklin, 4 – Final – Franklin cashed in for all four of its runs in the fourth inning to defeat Foxboro. Trailing the Warriors, Franklin senior Cam Lupien delivered with a two-run single to put the Panthers ahead. Ryan Hodgkins came through with an RBI single to tack on an insurance run for Franklin. Jake Noviello earned the win on the mound, going 6.2 innings with just three hits allowed and three walks. Bryan Woelfel came in with runners on first and second in the top of the seventh and got the final out for Franklin. Chad Bearce went 2-for-3 with a pair of doubles and knocked in both of Foxboro’s runs. Steve McLaughlin had a strong outing on the mound for Foxboro, throwing a complete game while Colin Thoener had a strong day at third base. Stoughton, 2 @ King Philip, 1 – Final (8 inn.) – Click here for a recap of the game. Sharon, 3 @ Oliver Ames, 9 – Final – Oliver Ames’ offense got off to a strong start with four runs in the first inning and Kayla Georgeu had one of her best outings of the season in the circle – and at the plate – to help the Tigers handle Sharon. Freshman Katie Abreu doubled in Lexie Campbell (two runs, steal), Caroline Mahoney (2-for-4, three RBI) knocked Abreu in with a double and Katie Mills (2-for-3, run) drove in Colleen Larson (two runs). Georgeu allowed six hits on the mound while striking out seven batters. Georgeu also knocked in a run in the first and had a home run in the third inning. Victoria Ziner (2-for-4, double, stolen base, run) and Campbell scored in the fourth inning of a single from Mahoney to cap OA’s scoring. Sharon, 5 @ Milford, 0 – Final – Sharon dropped just four games total in singles play and three in doubles play in a sweep of Milford. Freshman Alberto Olivei won 6-0, 6-0 at first singles, senior Alex Romantz won 6-2, 6-1 at second singles and senior Sammy Kirshenbaum won 6-1, 6-0 at third singles. The team of Ashwin Sreevatsa and Arie Chinnappan won 6-1, 6-2 at first doubles and Max Brody and Russell Rapaport won 6-0, 6-0 at second doubles.